Posted on May 7, 2014 by Clare Cooks! I have said it before, and I will say it again, brunch is my favorite meal. It’s really just great. When it comes to breakfast foods, I kind of have an aversion to sweet and bready things and egg dishes can get a bit boring*, but if I’m at brunch, it means I can totally order a salad at 9 in the morning and it’s not weird. This salad is perfect for brunch or lunch or dinner. I would eat it for any meal really. 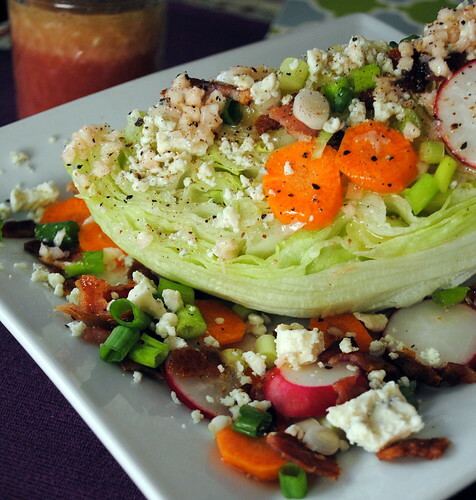 Wedge salads are one of my favorite salads and this is such a delicious spring twist on a traditional wedge salad. I was able to get all the ingredients at my farmers market, which made it feel even more seasonally appropriate. The flavors in this salad also worked really well together. I really like the vinaigrette dressing instead of a traditional blue cheese or ranch, which would have been way too heavy for this salad. 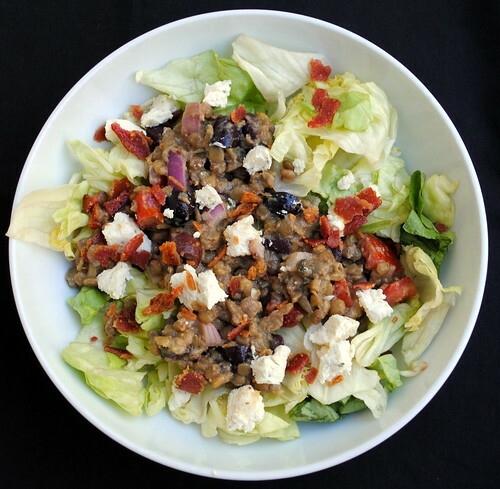 The blue cheese crumbles gave the salad a bit of creaminess and tanginess, so you really don’t miss the traditional dressing at all. This was my first time trying radishes and I was hoping that they would be a bit more peppery, they were still a good addition to the meal. Next time, there is only one thing I would do differently. I would make sure to cut the radishes and carrots as thinly as possible. Even though I used a mandoline to cut them this time, they were still quite thick (my fingers and I don’t have the best track record with the mandoline, so I try not to mess around with it too much) and it made them a bit difficult to chew compared to the rest of the ingredients. I think the carrots would probably be best done thinly with a vegetable peeler and maybe the radishes too. * – there is one brunch dish and only one brunch dish that combines sweet, bready and eggy that I absolutely love and I’ll be posting it later in the week. Trust me, it is definitely worth the wait! Trim stem from lettuce while leaving the core intact. 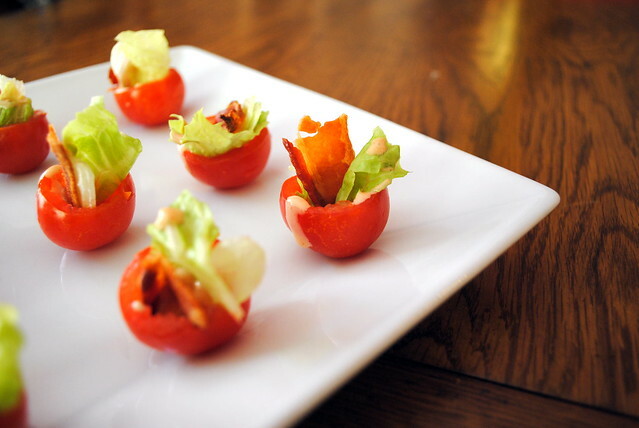 Cut lettuce in quarters then place the wedges on individual serving plates. 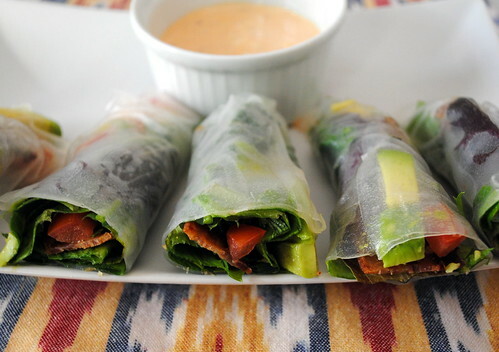 Arrange bacon, carrots, green onions, and radishes on and around each wedge. Sprinkle each wedge with blue cheese. In a screw-top jar combine olive oil, vinegar, garlic, salt, and pepper. Cover tightly and shake until combined. Immediately drizzle over salad. Posted on November 25, 2012 by Clare Cooks! 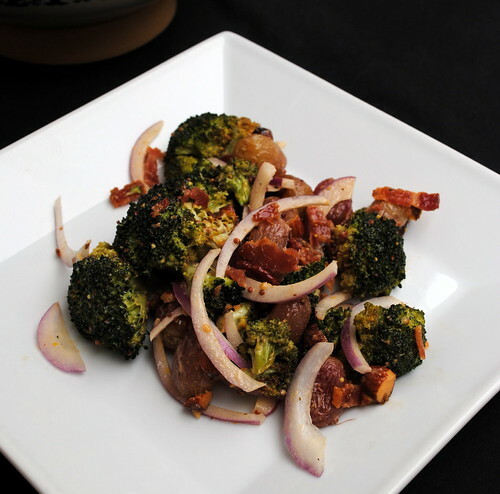 I was slightly hesitant to mix roasted broccoli and roasted grapes, but since I have had pretty good luck with roasting them separately, I figured combining the two couldn’t be too bad. 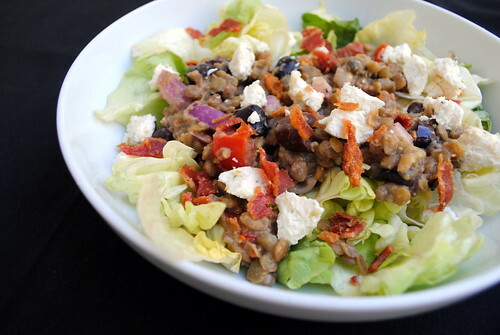 The roasted grapes gave the salad a caramelized sweetness, but it was subtle. I normally would not like anything sweet in a salad like this, but the tangy, creamy dressing kept it in check. They dressing really brought out the best in the other flavors in the salad. Preheat oven to 425 degrees F. Spread broccoli and grapes in a single layer on a 15x10x1-inch baking pan. Drizzle with olive oil, salt, and pepper and toss to coat. Roast, 20 to 25 minutes or until broccoli is starting to brown and grapes are soft, stirring once halfway through roasting time. Remove from the oven and sprinkle with red onion. Cool slightly. Meanwhile, in a small bowl whisk together the mayonnaise, lemon juice, and mustard. 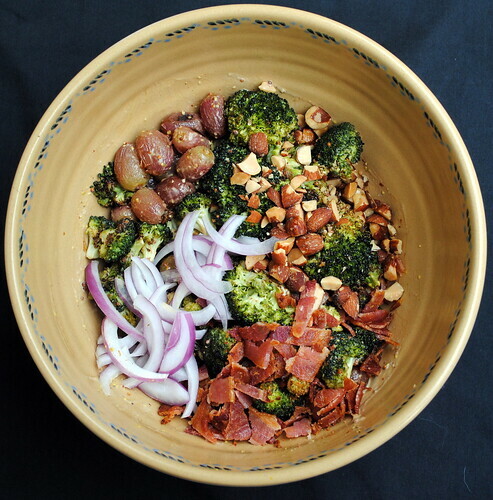 Place broccoli mixture in a serving bowl. 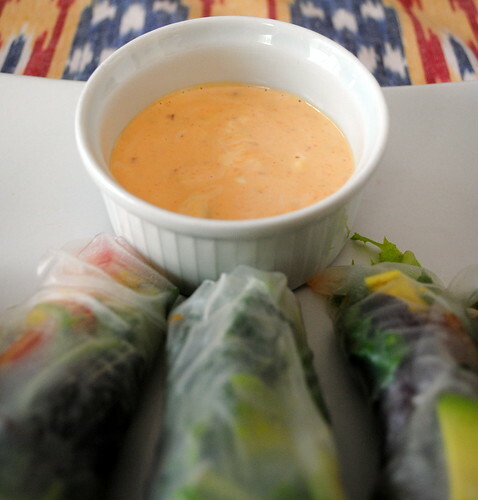 Toss with the dressing and top with bacon and smoked almonds. Posted on April 14, 2012 by Clare Cooks! I wanted to make this pizza the second I saw it. I finally got around to it this past week. My brussels sprout obsession has been well documented. Put brussels sprouts and pizza together and I was easily sold. If you are a brussels sprout skeptic, I swear this recipe could make you a convert! 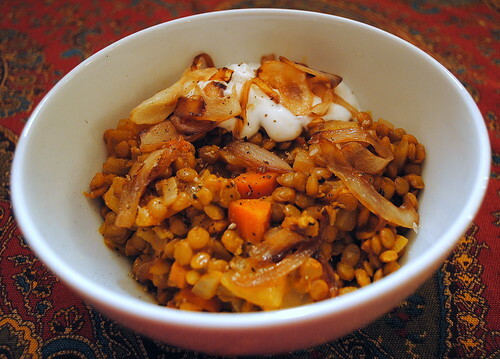 If you have already seen the light and love b. sprouts as much as I do, I know this will quickly become a new favorite. I’m currently debating with myself if making it again already is too soon? I don’t think it is. I will definitely make this again. I thought that the garlic and onion in the dough made the crust extra tasty and really added to the overall flavor of the pizza. You could easily just mix garlic and onion powder into any pizza dough recipe. I also liked how the brussels sprouts and onions got coated with a bit of a caramelized balsamic glaze. Definitely make sure you toss them in balsamic and olive oil! It makes all the difference. I would also probably leave the bacon off. Bacon just does nothing for me. I don’t understand the obsession at all. 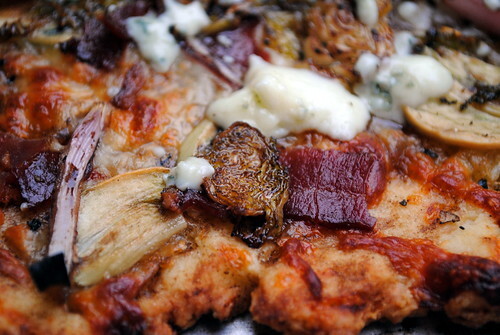 Plus, the addition of blue cheese definitely gave the pizza a flavorful, slightly salty bite that could easily replace the need for bacon on it at all. 1/2 red onion, thinly sliced. 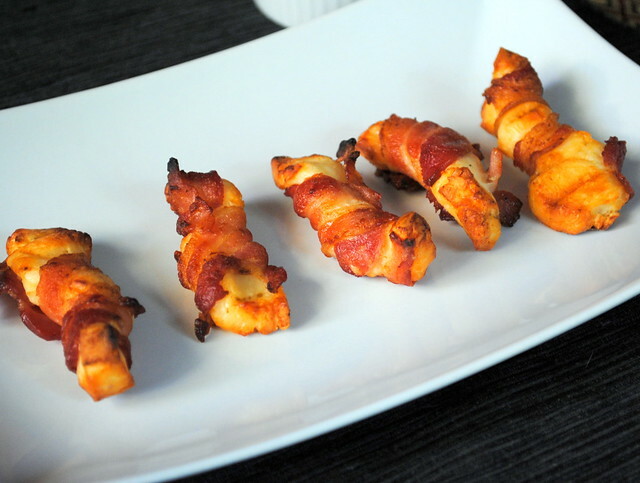 Prepare a rimmed baking sheet with a cooling rack placed inside, cook bacon in oven for 15-18 minutes. Remove from oven, set aside on a paper towel to drain. Oil a 13×18 inch rimmed baking sheet liberally with good extra virgin olive oil. Place the dough on the pan and stretch and press it out to the edges. If it springs back wait a few minutes and then proceed. The dough is very thin. If it tears, piece it back together. In a small bowl, add 1 tablespoon of olive oil and 1 tablespoon of the balsamic vinegar. Mix together with salt and pepper and brush on pizza dough. In the same bowl add the remaining tablespoons of olive oil and balsamic and toss brussels sprouts and onions in it to coat. 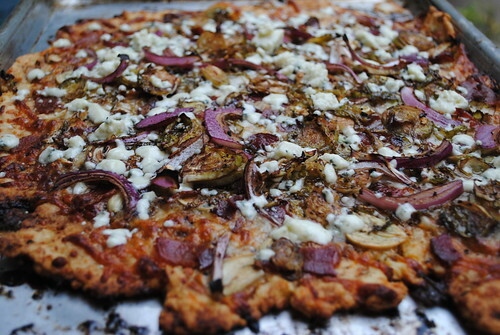 Evenly top the pizza dough with mozzarella, bacon, garlic, red onion, and Brussels sprouts. Add a heavy pinch of red pepper flakes, if desired. Put the pizza in the oven to bake for 15-20 minutes. To serve, top with crumbled blue cheese and serve!